To me, nothing says "comfort" quite like a cup of tea. And when I get together with my daughters, sisters or girlfriends, it's a natural. For whatever reason, tea seems to melt the stress away and makes me relax. So it is with this cup of kindness reminder. I created it to be a thank-you card but you could easily adapt it for birthday, get well, hello or just because. 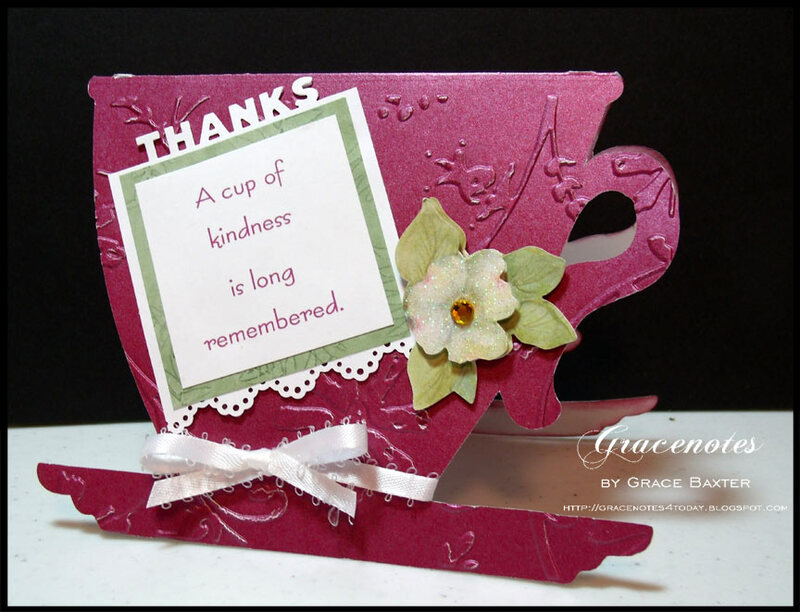 For this look, I used pearlescent cardstock and embossed the front teacup. I prepared the sentiment on my computer and matted it twice. The white mat is punched top and bottom to achieve the "THANKS" napkin with a lacy bottom. The teacup cut is from A Child's Year.